Recipient of the Jonah & Joan Sherman Scholarship for Community Service, the Gerard A. Cox Award for Service to Student Government, the Frances Reese Award for Community Service, and the Hermitage Award, at Marist College. "MJ" is a graduate of Marist College and former elected member of the Montville Township Board of Education. During his time as an undergraduate, Michael was involved with a number of leadership programs and organizations, including Toastmasters International, the American Student Government Association (A.S.G.A. ), the National Society of Leadership & Success (N.S.L.S. ), the Marist College Emerging Leaders Program (E.L.P.) and the campus' chapter of the National Residence Hall Honorary (N.R.H.H.). The crowned jewel of his collegiate career, however, was his time spent in the service of the Marist College Student Government Association (S.G.A. ), in which he presided as Senate Speaker for two administrations (from 2010 to 2012). In the Fall of 2016 he co-founded MSLstories.com with friend and fellow Red Fox, Brittany MacLeod. In his current role as Chief Empowerment Officer, Michael serves as Editor-In-Chief at MSL and leads the strategic development of our brand. He is also a frequent author on the site, sharing perspectives on life lessons in leadership and self-discovery. 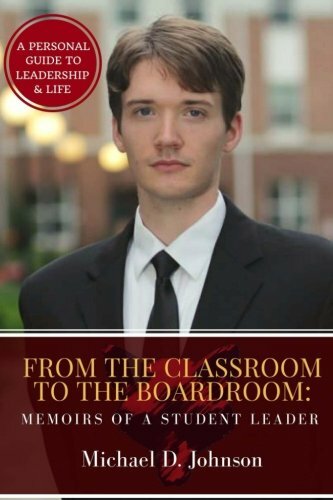 In the fall of 2017, Michael shared his story in his debut book, "From the Classroom to the Boardroom: Memoirs of a Student Leader". Massively multi-player online games offered us more than just an escape; they presented an opportunity to create entirely new identities in a community of shadows. As the lines between our online and offline lives continue to blur, what can these platforms teach us about the digital masks we carry into our own lives? It's no secret that our #MSL team includes big fans of the Broadway hit, "Dear Evan Hansen". In a past post, MJ even dissected an early scene from the play to look at the social-behavior drives behind an interaction with a particularly important character.